This badge was issued to Adrian Soeranto on 11 Jan 2019. The IBM Cloud Garage Test-Driven Development (TDD) badge earner has demonstrated the ability to complete the "red-green-refactor" TDD loop to produce quality code. They develop code using pair programming to write a simple assertion, the test to prove that assertion and then the code to implement the required functionality. Once the test passes from red to green they then continuously refactor to improve the code itself. 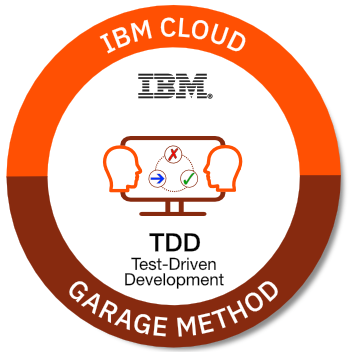 Complete the course: "IBM Cloud Garage Method - Test-Driven Development"